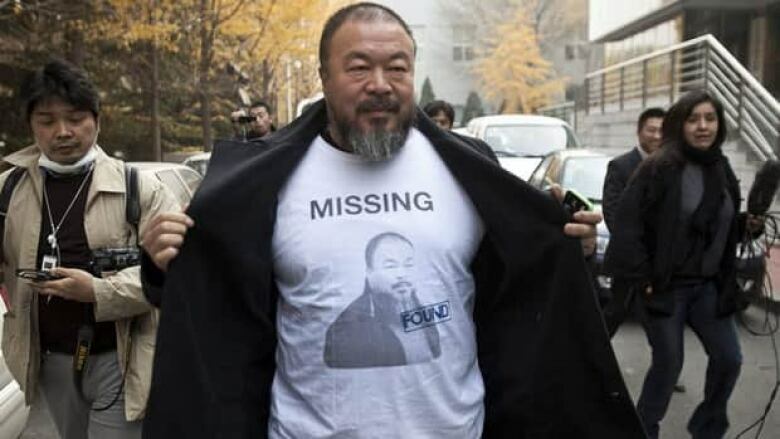 Prominent Chinese artist and dissident Ai Weiwei is criticizing Canada for not doing more to address human rights in China. The artist, who helped design the famous "Birds Nest" stadium but then backed away from the project over Beijing's handling of the Olympics, says he’s confident his country can change, but only if it faces international pressure. "If you’re dealing with a nation like China and you're not talking about human rights and judicial justice, then you're part of the crime," Ai said in an interview with CBC’s Q cultural affairs show. Ai made reference to Prime Minister Stephen Harper's recent trip to the Chongqing, saying that going there, without bringing up human rights, sends a bad message. The artist is currently closely watched and forbidden from speaking with foreign media. Chinese security officials keep his Beijing studio under constant surveillance. "I'm quite scared, but I still believe my effort will make some difference," he told CBC. Ai is still recovering from nearly three months in custody last year that he says were psychologically grueling. Ai disappeared for 81 days after his arrest, prompting an international outcry. His work, including Sunflower Seeds for the Tate Museum and Circle of Animals: Zodiac Heads for New York’s Central Park, has earned him a following among artists worldwide. He also is a savvy user of social media, blogging and using Twitter to call attention to injustice and corruption in China. His supporters believe it was Ai's taunting criticism of the state and judicial system that led to his arrest. Officially, Ai was charged with tax evasion and Chinese officials have demanded he pay close to $2 million in "back taxes." He is appealing the charges and the huge bill, aided by what he says are miraculous donations from compatriots. In the interview with Q, Ai describes his personal anger and frustration, saying there is no way of fighting back against the charges against him. "You’re not going to win. There is no court and no any system to stop what the police have been doing," he said. "It's extremely difficult at the moment because we all know the judicial system has failed for any sort of justice or fairness in the society." China restricts internet users from typing in his name and no media outlet is permitted to mention him – even to criticize him. "You are here and you are not existing," Ai said. Yet he is determined to speak out, as he believes he can use his international stature to make a difference to human rights in his homeland. There is "quite a strong need for the people in the world to understand China. and also because I'm at the centre of this event, I have the responsibility to let people know what happened to me," he said. His criticism of Western nations that deal with China without pressuring Chinese leaders over human rights could earn him more harsh treatment. His defiance on contact with the foreign media is also a sore point with Chinese authorities.